For undergraduate automotive courses in Automotive Climate Control/Heating and Air Conditioning. 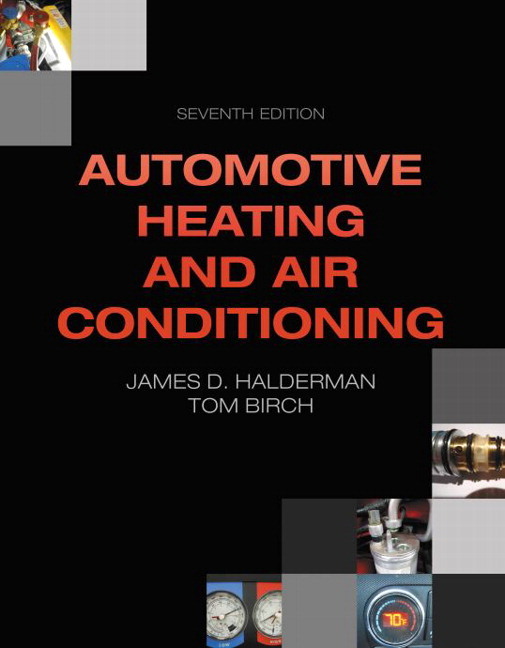 Automotive Heating and Air Conditioning, 8/e provides a complete, state-of-the-art source on automotive heating, ventilation, and air conditioning systems, as well as the practical skills that students must master to be successful in the industry. The text focuses on the generic theory that underlies the operation, diagnosis, and repair of the units and subassemblies found in the many makes and types of vehicles students will likely encounter in their careers. 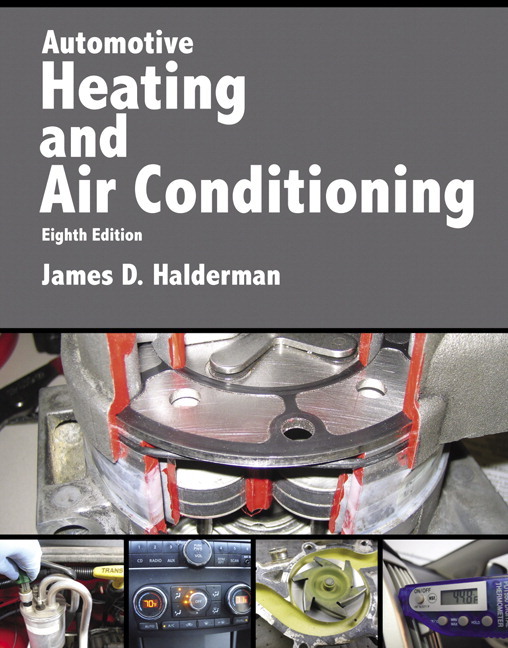 Formatted to appeal to today's technical trade students, Halderman uses helpful tips and visuals to bring concepts to life and guide students through the procedures they'll use on the job. To keep your course current, all of the content is correlated to the latest NATEF tasks and ASE areas, and includes expanded content on R-1234yf refrigerant, a new chapter on engine coolants, a new chapter on HVAC system inspection procedures, new content on sealant filters, over 50 new full-color line drawings and photos, new case studies in selected chapters, and more. All terms in the new edition adhere to the SAEJ1930 standard. Present topics in short, easy-to-read chapters. The content is broken into small, manageable segments. It features twice as many chapters as competitive texts so that a topic or an entire short chapter can be assigned and taught instead of assigning individual page numbers or questions. NEW! Chapter reorganization and expanded coverage add to the text’s ease of use. Visualize concepts with full-color photos and line drawings. Photos and line drawings complement the text. The photos show the actual parts involved so that the student can view a good or defective part. The line drawings allow the reader to see what is inside a component and how it works. NEW! Over 50 new full-color line drawings and photos make the subject come alive. NEW! Case studies have been added to selected chapters that include the “three Cs,” Concern, Cause, and Correction. NEW! Expanded content on R-1234yf refrigerant (Chapter 4). NEW! A new chapter on engine coolants (Chapter 7). NEW! A new chapter on HVAC system inspection procedures (Chapter 13). NEW! New content on sealant filters (Chapter 15). NEW! All terms used adhere to the SAE J1930 standard. New chapter organization and expanded coverage. Expanded content on R-1234yf refrigerant (Chapter 4). Over 50 new full color line drawings and photos make the subject come alive. Case studies added to selected chapters that include the “three Cs” (Concern, Cause and Correction). New chapter on engine coolants (Chapter7). New chapter on HVAC system inspection procedures (Chapter 13). New content on sealant filters (Chapter 15). All terms used adhere to the SAE J1930 standard. Jim Halderman brings a world of experience, knowledge, and talent to his work. His automotive service experience includes working as a flat-rate technician, a business owner, and a professor of automotive technology at a leading U.S. community college for more than 20 years. He has a Bachelor of Science degree from Ohio Northern University and a Master’s degree in Education from Miami University in Oxford, Ohio. Jim also holds a U.S. Patent for an electronic transmission control device. He is an ASE certified Master Automotive Technician and is also Advanced Engine Performance (L1) ASE certified. Jim is the author of many automotive textbooks, all published by Pearson Education. Jim has presented numerous technical seminars to national audiences, including the California Automotive Teachers (CAT) and the Illinois College Automotive Instructor Association (ICAIA). He is also a member and presenter at the North American Council of Automotive Teachers (NACAT). Jim was also named Regional Teacher of the Year by General Motors Corporation and a member of the advisory committee for the department of technology at Ohio Northern University.